Recently I bought an FT817. There were two reasons for this, firstly, to drive the 70 Mhz transverter I have built, and secondly so I could do some portable HF operating. After paying ML&S a princely sum for a Wonder Wand antenna to go with the 817 I was underwhelmed with its performance. I will be generous and attribute this to the less than stunning take off from my QTH. However, I knew I could do better. On trawling the Internet I came across the HF Pack website and found the page relating to their antenna shoot-out. The PAC-12 antenna designed by James, KA5DVS performed well compared to the reference vertical and James has published the design here. It took me some time to produce my own version but I now have a reproducible design. The 72 inch telescopic whip from the Wonder Wand has been reassigned as the top section of my PAC-12. I have built three loading coils, for 40m, 20m and 17m. For the coils I used 16SWG enamelled copper wire. For some reason I found that I needed a lot more turns on the coils than James's design to make the antenna resonate at the appropriate frequency. My version of the PAC-12, with coils for 40m, 20m & 17m. My version does not need the threads cut into the rods as in James's design as for the bottom section I used a hollow rod which started life as the support for a light. That, some black tubular conduit that I found in my shed and some 15mm plastic water pipe and end-stops are the other main components. In Clas Ohlsen I found brake pipe connectors, which I have used inserted into the water pipe end stops to mount the telescopic antenna into. Ideally these would have been about twice as long and if I find a suitable alternative I will replace them. At one end of these brake pipe connectors is a smaller hole, through which I inserted a small bolt with a solder tag and nut on the lower side to solder to the top of the loading coil, see picture below. Through the end stop and the brake pipe connector I drilled a small hole to take a screw that is used to retain the telescopic section. The bottom end of each coil has a solder tag type connector attached to the end of the coil and this is threaded through the bolt that goes through the top of the hollow rod that forms the bottom section of the antenna. The hollow rod fits neatly inside the plastic conduit and I have a bolt through the conduit that the rod rests upon. The plastic conduit can then be tie wrapped to a tripod for support or just supported by a couple of large rocks. Through the very bottom of the hollow rod I have a self-tapping screw to connect a piece of wire which is then taken out to an SO239 connector. I also have a phono socket connected to the screen of the SO239, my counterpoise wires are attached via a phono plug to the socket. In the garden at home and on the balcony of our holiday apartment the antenna works well. However, the connections failed the ruggedness test. On holiday in Switzerland we were surrounded by 4000m peaks. We were at 1800m so there was over 2km of towering rock for any signals to get through. As we were close to the border with Italy 40m was always full of Italian stations, in the apartment there was a lot of interference on 20m, and I heard a few station on 17m (most notably one from Bahrain running 1kW). So it seemed like there was a need to get higher. One day we caught a cable car up to around 2700m to a point with a fantastic take of in most directions. The picture below is of the TV transmitter about 200m below the location. So with the antenna set up I had a listen around on 20m. There was a UK station just completing a contact with a US station. However, my SWR seemed a little too high so I decided to switch to 40m. I immediately heard a portable DL station calling CQ SOTA. He was very strong. However, I had a noise figure of S0 rather than the more normal S7 so I was suspicious. A quick whistle into the microphone confirmed that my SWR was very high. 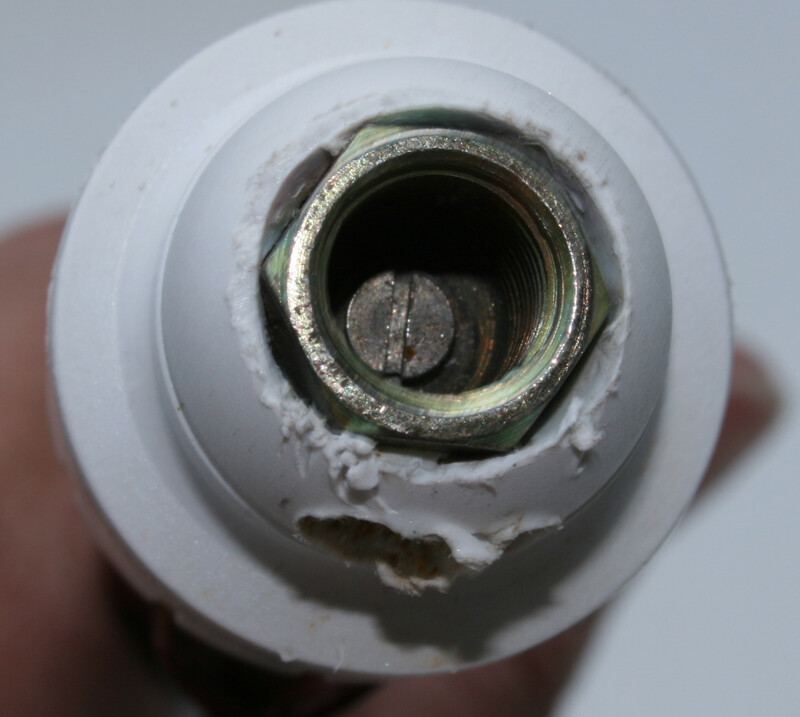 Further investigation showed a small design flaw in the connection of the hollow rod to the SO239 that I could not resolve. During a quick tune round I heard an French portable station also calling CQ SOTA. I'm sure I could have made a few contacts but I need to make some alterations so that the antenna passes the ruggedness test. When I have made these alterations I am looking forwards to taking the antenna out portable away from home. We live in a bit of a hole in the ground and I am intrigued what HF reception I will get on one of the high points in Surrey.